The treatment of the infectious and other diseases via the inhibition of their causative agents involves the induction of the immune system through the process of vaccination. An effective and successful outcome with the vaccines is achieved only when they are able to raise the antigen specific acquired responses of the immune system that involves memory. The major mediators of this form of immunity are the lymphocytes. The B lymphocytes generally deal with the pathogens which are external through the formation of antibodies while the internal pathogens are tackled by the T lymphocytes that involve cytokine producing inflammatory responses. Besides the classical way of the application of vaccination during which the acquired immunity against the target antigen is stimulated, there is a great deal of interest among the individuals regarding the significance of innate immunity. This form of immunity has been found to be involved with the beneficial microflora of the hosts or the administration of the probiotics. Infact, it has now been established that the early exposure to the gut microbiota in the lives of the neonatals is absolutely necessary for the development of mucosal immunity. Therefore, there are good reasons to believe that the probiotics can be used as effective means of vaccine delivery. The Scientists face significant problem in the generation of effective means of delivering the vaccines. Traditionally, the delivery of vaccines have involved the heat inactivated pathogenic form or their recombinant proteins or cellular parts. Generally, these forms are regarded safe and there are no chances of them being reverting back to the pathogenic form. But they stimulate only transient immunity of the cells which are only but weak. Another approach requires the use of the pathogen in its attenuated viable form. This mode of delivery is quite effective but always carries the chance of the mutant pathogen going back to its pathogenic phenotype. According to recent advances in the field of medical sciences, probiotics are being engineered to be used as efficient and beneficial tools of delivering vaccines which could induce both the acquired and innate immune responses. It also does not carry with it the problems that may arise due to the reversion of the attenuated pathogenic microbes in stimulating immunity. Genetic engineering has been applied remarkably to manipulate the probiotics and use them as vaccine vehicles. In a recent work, the adhesion factor inlA from Listeria monocytogenes was inserted into the genome of L. lactis. This transformed strain of L. lactis can easily get access and colonize the small intestines within the recipients and then deliver the molecules that can induce immuno responses in them. Thus, it can be a much easier and safer way of raising immunity as compared to the one induced by the attenuated forms of L. monocytogenes. In addition, if hlyA is added to L. lactis strain possessing inlA, it can promote their escape into macrophagic phagosomes. During that time, the immune responses generated are quite comparable to the one induced by cellular pathogenic bacteria. The administration of probiotic vehicled vaccines through the mucosal path can represent the immunity induced during the course of naturally occurring infection which can lead to immune responses that involves memory. This way of vaccine delivery has the added advantages of cost effectiveness and technology while considering the developing countries. There are a number of ways of how the probiotics could be used as vehicles of vaccine delivery. A number of newer antigens have been isolated and characterized from the pathogenic microorganisms that are known to cause some of the major human health problems. All these have been possible due to the recent revolution in the cellular and molecular biology field. However, in order to use them as effective means of vaccines in generating immunological responses in the individuals it is highly dependent on their successful delivery within the host body without significant loss in their antigenicity. The spores produced by the bacteria are generally symbolic of the adverse prevalent conditions present for the organism in its surrounding. The spores remain in a dormant state which germinates only upon getting the favorable conditions. These robust microbial forms are therefore now tried to be used in the delivery of vaccines which can couple the advantages of both the nano particles and the live organisms and can be highly potent agents of delivering antigens to raise immunity. The spore producing probiotic bacteria can be all the more useful to serve that purpose with all their beneficial effects. According to a work by Boersma et al., which assessed the efficiency of the probiotic bacteria as oral vaccines, it was found that the Lactobacillus strains could be used as a versatile way of delivering vaccines which could fulfill the vacuum left over by the traditional modes of vaccine delivery. Others have used Lactic acid bacteria efficiently in the mucosal delivery of the vaccines. This mode of administration was efficient in stimulating innate immune responses as well as resulted in the increased release of secretory IgA. In addition, they are cost effective, easy to administer and minimized the adverse side effects. Genetically engineered probiotic strains expressing proteins, cellular parts, etc of the pathogenic microorganisms have also been tried out. This form of vaccine delivery yielded significant results in eliciting the beneficial responses from the human immune system. 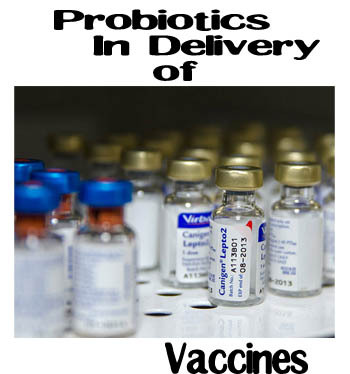 Probiotics can therefore be used as excellent vehicles for vaccine delivery. There are very less chances of adverse effects, immune response induced are quite strong and long lasting. Moreover, they have been relatively cost effective than the other modes of vaccine delivery. In addition, the probiotics have been put to use as vehicles of delivery in a number of ways that range from the use of bacterial spores to the genetically engineered probiotic strains. Although each of them are beneficial and induced protection against the disease, the choice of the best form of delivery would depend upon the specific case for which they are intended to be used.